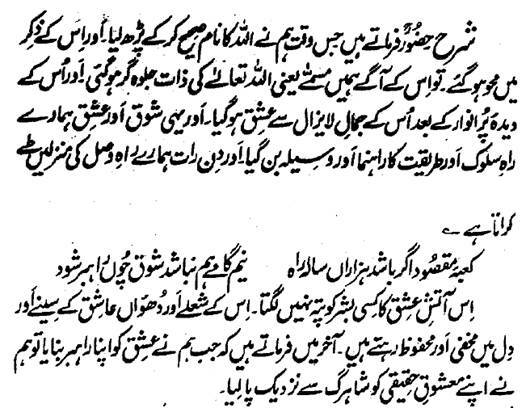 Hazrat Sultan Bahu Rahmatu-Allahe Ta-aala Alaihe says that: the moment, we read the Name Allah correctly in valid way and were preoccupied by His Zikr, the Essence of Haq revealed its Manifestations ahead and we fell in Ishq with His Undying Beauty and this Zeal and Love acted as a guide of the course of Salook and the means of Tareeqat for us and day and night lets us cover the destinations of Ishq. When the fervor is your guide, you will reach there in half a step. No one can detect this fire of Ishq in us. Its flames and smoke remain hidden and covered in the bosom of the Aashiq. 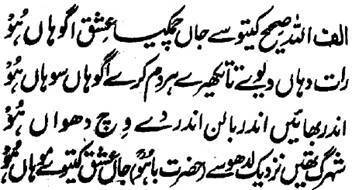 When we declared our Ishq our Guide of the Course, we found the Real beloved nearer to our jugular vein.